Today's contribution comes from Larry York, and is used with his permission. Click to enlarge! 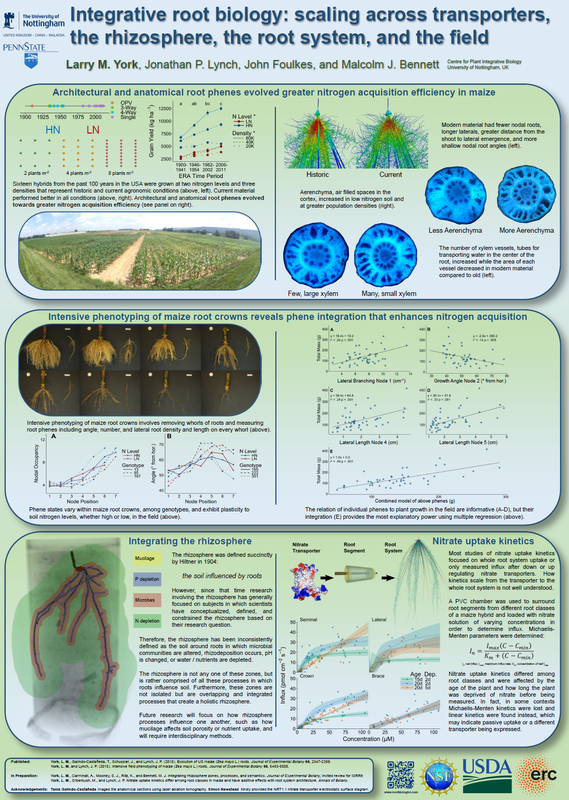 There is too much text on the bottom of my poster, but the overall idea of the poster was a review of my recently published and ongoing work. One thing this poster does well is direct the reader through the the tricky portrait format. It’s clear that this poster is meant to be read across, in rows. Another thing it does well is the choice of colours. The blues and greens are clearly related to the colours happening in the figures. The background colours are subtle, although the greens might even be just a little lighter. I agree with Larry’s own assessment that this poster has got too much going on, particularly in the bottom. But it’s not just the text. The overall feel of this is “jam packed,” but not in a good way. Less stuff and more space between everything would surely improve the appearance of this poster. There are many complex graphs. The layout within each row is sometimes slightly confusing. In the first box, I have three graphs on top of text on top of a picture. The graphs don’t have any caption below them, so I am left to try to make sense of them by reading the text. Maybe the text should come first. Similarly, on the left side of the top box, I’m forced to zigzag back and forth around the (nice but complex) pictures. Short of a ruthless edit, there are things that might help out. I tried a couple of quick and dirty revisions. First, I put the title in a more prominent location. The title is 90% of your communication effort, and people will start reading in the the top left. Let’s put the title there instead of logos. I shrunk the logos a little to create a bit more space. On the first box, I removed the thick blue lines to see if just colours would allow you to follow the flow of the poster. I didn’t do this for the boxes below, because... well... then this would no longer be a “quick” makeover. The combination of the green box plus shadows would allow you to follow the reading order, but removing the heavy blue lines helps open up the poster and make it feel less cramped.